Here we find a letter from Evelyn Waugh to the novelist Nancy Mitford, written in 1946, regarding a review in the New Statesman and Nation by Henry Reed, of Mitford's novel, The Pursuit of Love. Waugh is "irritated" by Reed's review, and by newspapers and journals and news, in general. Waugh doesn't know who Reed is, and even seems to think the byline on the review is a pseudonym (this despite Reed having reviewed Brideshead Revisited just the year previous). Waugh does somehow infer Reed's homosexuality on the basis of his review, but mistakes him for a lesbian. Since sending you a post-card today I purchased the New Statesman. I thought 'Reeds'1 review of your book egregiously silly both in praise & blame. I love all the Mitford childhood, as you know, but to single out the buffoon father while totally ignoring the unique children's underground movement is brutish. He calls your one false character 'a brilliant sketch'2. You know better than I how wrong he is about Fabrice. The review irritated me greatly. I wonder who it is who writes it. Plainly a homosexual; perhaps a Lesbian? The only thing that made any sense in the paper was a grovelling apology to a soldier they had insulted, but that had been dictated, presumably, by some intelligent solicitor. How can you read it? It explains all that modern trash that encumbers your shop. 1 Henry Reed (1914- ). Poet and BBC producer. 2 Talbot, the middle-class communist in The Pursuit of Love. 3 Raymond Mortimer was reviewing The Approach to Painting by Thomas Bodkin. Here is the irritating review, from the New Statesman for February 2, 1946. Reed invokes several lessons from Joyce, including the best description of synecdoche ever written: "When a part so ptee does duty for the holos we soon grow to use of an allforabit." The Pursuit of Love. 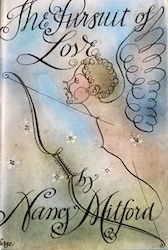 By Nancy Mitford, Hamish Hamilton. 8s. 6d. Of Many Men. By James Aldridge. Michael Joseph. 8s. 6d. The Crater's Edge. By Stephen Bagnall. Hamish Hamilton. 6s. He raged around the house, clanking cups of tea, shouting at his dogs, roaring at the housemaids, cracking the stock whips which he had brought back from Canada on the lawn with a noise greater than gun-fire, and all to the accompaniment of Galli Curci on his gramophone, an abnormally loud one with an enormous horn, through which would be shrieked "Una voce poco fa"—"The Mad-Song" from Lucia—"Lo, here the gen-tel lar-ha-hark"—and so on; played at top speed, thus rendering them even higher and more screeching than they ought to be. ... the spell was broken when he went all the way to Liverpool to hear. Galli Curci in person. The disillusionment caused by her appearance was so great that the records remained ever after silent, and were replaced by the deepest bass voices that money could buy. "I reckon," Uncle Matthew would say proudly, "that we shall be able to stop them for two hours—possibly three—before we are all killed. Not bad for such a little place." Wolfe entered Damascus with the French. The day after they arrived the Germans invaded Russia. Wolfe got the first Nairn bus that went to Baghdad and then he flew over the dead mountains to Teheran. The Russians in Teheran said they were sorry that Wolfe had been in Finland, very sorry; but if he waited maybe he would get a visa. He waited a long time and the Red Army was still retreating to the Dnieper when he left Teheran. He could not get a visa. The Germans were also in the Western Desert now. They had pushed the British back in to Egypt and had encircled and isolated the Australians at Tobruk. Wolfe went into Tobruk on one of the relief boats. If a girl loves someone at the age of sixteen for whom she has protested the madness of her love as a child of eight, even then he cannot be sure of her constancy, because, since nothing came of that protestation, nothing has flowered, and therefore nothing has had an opportunity to either flourish or die. Rather it has been in a state of perennial bud. So at first he made a noble decision of renunciation. Or perhaps it was not so much a decision he made as an attitude that he struck. Because he knew all the time he would not remain faithful to it. Yet he held it long enough to crystallise, or perhaps embalm, it in a sonnet of great-hearted finality and generous resolve. Generous himself at this point, Mr. Bagnall spares us the sonnet; but he spares us little else. His theme is one of those old, well-tried ones, which were never any good even when new: the theme of the dying man reliving the past. Not even vivid interludes can remove the distrust one has for a story whose end is also its beginning; and Mr. Bagnall's story has no vivid interludes. It is merely a series of lush reminiscences about the hero's four loves: his love for a ballet dancer (platonic), for a schooldays' friend ("without lust"), for a girl called Celia (with), and youthful Elizabeth (the real right thing once more) With its juicy, self-admiring prose, its purple passages, its recklessly misrelated participles and its lengthy commonplaces about the major problems of life, it is not an easy book to read. The point of Mr. Aldridge's book lies quotation which prefaces it: "War is the shape of many men, those in the sun and those the shade; many hands clear the shade, but in truth they have only succeeded when the last shadow is gone." The book begins with its hero, emerging from the Civil War in Spain; during the next few years, in an unspecified capacity, he tours the second world war in Finland, Norway, Syria, Africa, Malaya, the Pacific, Italy and Germany; the facility with which he gets about will be seen in the passage I have quoted. After VE Day he announces his intention of returning to Spain, and the point of the book is made clear. Presumably if Mr. Aldridge had waited a month or two longer, we could have accompanied his hero to the bombing of Hiroshima (doubtless inside the actual aircraft) and to the meetings of Hirohito and MacArthur. The pity is that even when we have had the overwhelming course to accept Mr. Aldridge's style as a means of communication, he appears to have nothing to communicate beyond his central statement; the scenes we visit as we fly from one battle-front to another are stupefyingly machine-made. And though none will doubt the the truth of his epigraph, and few will doubt its application to Spain, it is a pretty bald gag to write a book about. What is Henry Reed's first name?